1. Heat the oil and butter together in a non-stick 20-22cm diameter sauté pan. Add the onion and courgettes. Season. Once the vegetables are sizzling, turn the heat to low, cover, and cook for 8-10 minutes, stirring now and then, until softened. 2. Beat the eggs in a jug until combined, then stir in most of the dill and all but 2 tablespoons of the cheese. Season. 3. 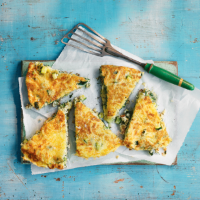 Pour the egg mixture over the vegetables and cook the frittata over a medium heat for 7-8 minutes, or until the eggs are nearly set. Meanwhile, preheat the grill on a high setting. 4. Sprinkle the rest of the cheese over the frittata. Cook under the hot grill for 3-4 minutes, or until golden, bubbling and just set in the middle. Scatter the remaining dill on top and leave to cool. 5 Slice into 6 or 8 wedges. Stack in an airtight box, each wedge separated by a sheet of non-stick baking paper. TIP: You can make this a few hours ahead.